HWRS offers a variety of polyester and polyester blended ropes, which are stronger and are more abrasion resistant than nylon rope. 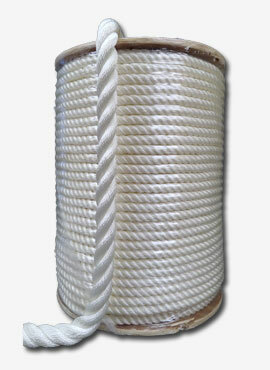 Unlike nylon rope, polyester has a low stretch factor. This is characteristic that makes polyester a popular choice for boating and marine applications. Another property of this rope is that it is UV resistant. Below is a list of the traits of polyester rope. Good resistance to alkalis and acids at room temperature. As the temperature increases, the resistance decreases. Excellent resistance to petroleum based products, bleaches and solvents. However, this does not mean it is not affected. polyester ropes will weaken if soaked in strong bleach for a long period of time. With all of the advantages of polyester rope listed above, there are also a few disadvantages to consider. Since polyester does not give like nylon rope does, polyester rope is not suitable if the load is subject to jerking.